De Profundis was written by Oscar Wilde during his imprisonment in Reading Gaol. It is a 50,000 word letter to Lord Alfred Douglas, his erstwhile lover. 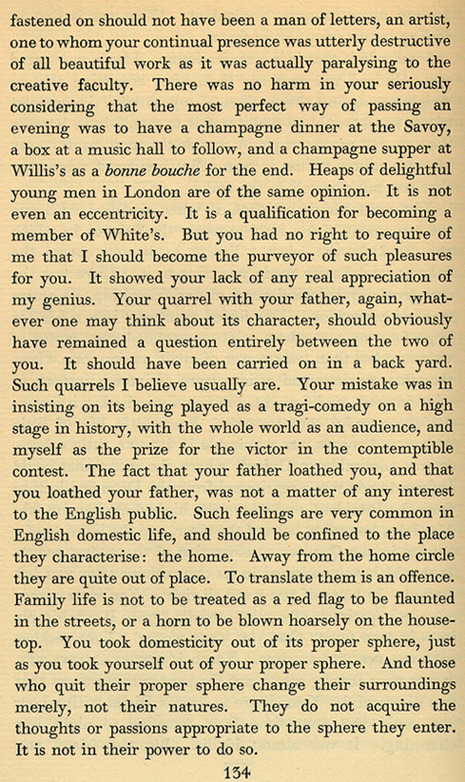 Wilde wrote the letter, between January and March 1897, though he was not allowed to send it, he could take it with him upon release. In it he repudiates Lord Douglas for what Wilde finally sees as his arrogance and vanity; he hadn't forgotten Douglas's remark, when he was ill, "When you are not on your pedestal you are not interesting.". He also felt redemption and fulfilment in his ordeal, realising that his hardship had filled the soul with the fruit of experience, however bitter it tasted at the time. On his release, he gave the manuscript to Ross with the putative title Epistola: In Carcere et Vinculis ('Letter: In Prison and in Chains'), who may or may not have carried out Wilde's instructions to send a copy to Douglas (who later denied having received it). Ross published it under the title De Profundis - expurgated of all references to the Queensberry family - in 1905. This title, meaning "from the depths", is an allusion to Psalm 130. It was expanded slightly for an edition of Wilde's collected works in 1908, and then donated it to the British Museum on the understanding that it would not be made public until 1960. In 1949, Wilde's son Vyvyan Holland published the full text, but used a faulty typescript bequeathed to him by Ross. Ross's typescripts had contained several hundred errors, including typist's mistakes, Ross's 'improvements' and other inexplicable omissions. Complete and correct publication first occurred in 1962 in The Letters of Oscar Wilde. The British Museum published a facsimile of the original manuscript in 2000. Years later, when Lord Douglas served six months in prison for libelling Mr Churchill he wrote a sonnet sequence entitled In Excelsis ("from the heights"), intending to mirror Wilde's letter.